In the last few years, slots have attained the status of the most popular game in online casinos which is anything but surprising considering their huge entertainment value and the dynamic pace of play. The latest craze among fans of this type of game is participating in slot tournaments, which is a popular option at both brick-and-mortar and online casinos. Such tournaments pose as a great option for players who are looking to spice up their gameplay a bit and add more excitement to their betting session by competing against fellow slot fans. Slot tournaments are easy to play which renders them appealing to all types of players. Similarly to spinning the reels on regular slots, you will need mostly luck to make it to the top. Read on for more information on how slot tournaments work, and what the advantages and disadvantages of participating in one such competition are. Slot tournaments work roughly in the same fashion as all other types of tournaments. A number of players get together either online or at a landbased casino and compete against each other in the same game. Of course, in order to partake in the competition, players are required to sign up for the slot tournament in advance, either online or at their preferred landbased casino. Depending on the tournament type, the players may need to buy their way in by paying a predetermined entry fee. Needless to say, the price of entry depends on the tournament’s structure and the casino where the tournament is being held. How much participation in the tournament costs is directly correlated to the prize pool. Some loyal patrons of the casinos may sometimes be granted invitations to such slot competitions. In both landbased and online casinos, the tournaments are announced in advance so that players can sign up for participation. The casino operators set a starting time for the tournament and advertise it to attract a greater field of players to contribute to the prize pools. The rules may vary from one tournament to another. For instance, in many tournaments players are prohibited from using functionalities such as the Autoplay feature. At the start of the tournament, all players who have signed up for participation are granted the same number of credits to start playing with and are competing on the same slot machine or title. Also, the competition usually lasts a specific period of time. With most tournaments, the winner is the player who has generated the highest score (the highest number of credits) within the designated amount of time. The first few players to finish in the top places receive the biggest cuts from the prize pool. In some tournaments, players with the most spins or with the lowest total of credits receive consolation prizes as well. The casino which organizes the tournament also collects a cut from the prize pool, which is why players should always examine the tournament’s structure to see whether or not the prize pools are worth paying the entry fee. The number of participants is another factor to consider. This is important because it affects one’s chances of coming in first, but also indicates how many participants have contributed to the accumulation of the pools. The length and the number of rounds of the tournament also need to be factored in. Shorter rounds are more dynamic and offer greater excitement while longer rounds allow for bigger swings, with different players leading and falling behind in the rankings. Playing at a faster pace is a must when it comes to slot tournaments because otherwise the player may fail to use up all the credits within the designated period of time. Depending on the structure and the entry fees players need to pay to buy their way in, it is possible to distinguish several types of slot tournaments. You can read more detailed information on these below. The name of this type of slot tournament pretty much speaks for itself as such competitions will cost players nothing in order to enter. There is no fee in this case, slot fans simply need to enter the tournament and compete for the designated time, set by the casino, on the game that qualifies for the occasion. Freerolls usually last for about an hour and consist of several rounds, between five and seven minutes each. The goal is to generate as many credits on the slot as possible because this will enable you to climb up higher on the leaderboard. Casino operators typically advertise the scheduled slot tournaments in advance and announce the precise start and end times of the competition upfront. We can distinguish between two basic types of scheduled slot tournaments, both of which require participants to contribute with a buy-in fee. In the first type of scheduled tournament, the size of the prizes for the top finishers is decided in advance, which is to say the prize pool remains the same regardless of how many players have signed up for participation. In the second type of scheduled slot competitions, the casino operator distributes the prize pool that has been accumulated from entry fees among participants. This is to say the greater the number of players to join the tournament, the larger the prize pool will get. A lot of similarities can be outlined between Sit and Go tournaments for slots and for poker. These competitions usually have a predetermined length and the maximum number of players allowed to join in is also set in advance. The tournament starts as soon as the maximum number of players have signed up for participation. Sit and Go slot tournaments usually continue for no more than an hour and the pools again consist of the players’ redistributed entry fees. The name of these tournaments pretty much indicates what they are all about. In many cases, these are knock-out tournaments where players need to compete in three rounds, each one lasting for about five minutes. There are no deviations in terms of rules and gameplay from one round to another, but the players with the lowest score are eliminated at the end of each round. Typically, the first ten players to finish in top places are awarded the prizes. Survivor tournaments are a rather dynamic and exciting option for slot fans as the intervals between each round are usually rather short, no more than a few seconds in most cases. What is unique about Extender slot tournaments is the fact that competitors are allowed to improve their base score by purchasing the so-called add-ons. The latter function the same way re-buys in poker tournaments do. In Extender slot tournaments buying add-ons is only optional but they improve players’ chances of winning the competition as they enable them to remain in the tournament for as long as possible. Extender tournaments are usually more expensive for players because the aforementioned add-ons are sold in stacks, but it is well worth it because this also helps one extend their overall score. 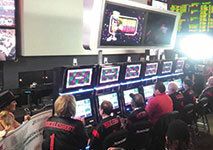 Players are allowed to buy their way back into what are known as Reload slot tournaments. These require participants to contribute with an entry fee in order to compete for a set amount of time, which in most cases is about five minutes. Each round is five minutes and the overall tournament lasts for about an hour. After a five-minute round ends, players are granted the option to re-buy their way back into the next round. The re-buys are optional and are sold in stacks of ten, so that players can compete uninterrupted throughout the whole length of the tournament. Participating in slot tournaments comes with a great number of advantages. Tournaments are a great way to diversify your gameplay and add more excitement to your betting session. As strange as it may sound, slot tournaments reduce the risk of overspending as players know in advance how much credits they will spend. In addition, participation in such competitions can indeed be lucrative since players can potentially collect rather hefty prizes in exchange for a relatively small buy-in fee. Then again, with freerolls one is not required to pay entry fee as a whole, not to mention some loyal slot players are granted free invitations for tournaments after they acquire a VIP status at the online casino. Some players pinpoint the exceptionally quick pace of play at such tournament as a disadvantage. While one practically gets better value for their money, the dynamics of the tournament combined with the pressure does not appeal to some slot fans. Another drawback results from the fact that usually it is the casino operator to decide which slot game the tournament will be played on. Some players consider it a disadvantage being forced to compete on a slot that does not correspond to their individual preferences and style. Besides, if players succeed in landing the jackpot, the jackpot amount will not be added to their prize money. 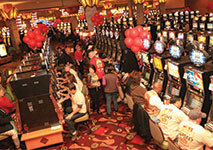 Despite the downsides, slot tournaments come with a higher level of anticipation and excitement. 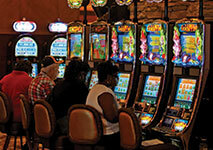 Anyone can partake in slot tournaments as no special skills are required. If Lady Luck is on your side, you can potentially finish the tournament much richer than you were at its start.